Another straight-sets victory at the ATP World Finals. Will we ever see a three setter at the 02? There might be hope of one tonight, although Andy Murray's fans will, of course, be hoping for a straightforward two-set win for the Briton. We'll be back tonight for more live text commentary for Murray's ding-dong against Raonic. David Law - looking ahead to tonight's second Group B match between Andy Murray and Milos Raonic - says: "We haven't had a three-setter yet, I think we'll have one tonight. It'll be nail-biting stuff, tense, because whoever loses goes home, effectively. I think Murray will win but it will be very, very, tense." Mistakes proved costly for Nishikori. He made five double faults, winning 67% of points on his first serve and 45% on his second serve. Another snappy victory for Roger Federer who moves to the top of Group B thanks to his victories over Raonic and Nishikori. He will next face Andy Murray, but could be assured of a place in the semi-finals by then. He can progress this evening if Raonic defeats Murray - or if Murray defeats Raonic in three sets (that's what I've been told anyway). "Winning the group would be great for Federer because it would probably mean missing Novak Djokovic in the semi-finals." Asked about Thursday's match against Andy Murray, Federer says: "I'm looking forward to playing Andy always. We've played some of the greatest matches for both of us, it's always a pleasure playing against him. I'm not sure I'm going to be able to watch tonight. I've got kids so it's during a time where I usually put everybody to bed." "I was expecting a very difficult match," says Federer. "I've know him since he was 17 years old and always thought he was a great talent and he's going to have a great future. I'm very pleased with the way I played. On his tactics, Federer says: "I'd like to come in much more but those days are long done, conditions have slowed down too much. I try to find a way. It's not as easy this week so you have to use different tactics this week." "Nishikori, for me, has played some impressive points, but not quite had the conviction and the belief. I just wonder how much the court speed is having an affect on his performance. "At the US Open the temperature, balls, and court speed combines to make it quicker. "Does Nishikori get slightly less on his shots here? Unless it's been an all-out rocket of a shot, Federer has been able to deal with it comfortably." There's no way back from here? Maybe. Federer falters at the net, which allows Nishikori to go 0-30 up but he is soon reined in, unforced errors again his downfall. Backhand long from Federer, though, presents Nishikori with a break point. Encouraging yelps from the crowd who appear to want more for their money. Federer's serve, though, once again gets him out of trouble. Deuce. Backhand winner. Match point. The umpire calls for quiet... First serve down the 'T'... Nishikori scrambling in vain... game over. Oohs from the 17,000-strong crowd as Federer approaches the net, turning defence into attack with a deep volley and forcing Nishikori to crumble. From 15-15- to 30-15, though, thanks to a crackerjack of a forehand down the line from Nishikori. The fifth seed clenches his fist in delight. But from highs to low as he nets a backhand, allowing Federer to level at 30-30, and another unforced error - his 27th of the match - presents Federer with a break point. Andrew Castle informs us Nishikori's first serves are around the 40% mark. Perhaps it's too late to improve for this match. Nishikori has plenty of guts, though, he saves two break points, but gifts Federer a third and surrenders with a double fault. As brilliant as Nishikori has been this year, there's plenty to work on if he is to test the three greats at the top of the rankings. If Nishikori wants to keep hopes of a comeback alive he really needs to start testing the Federer serve. A perfectly-timed lob reduces the Swiss' lead to 40-30, but on the next point Nishikori's forehand falters, over the baseline it goes, and Federer advances once more. "That's a huge hold for Nishikori. That game could have easily slipped away from him. He just needs to settle himself and to give it a big push to get back into this set. "You want to leave everything out there on the court. He wants to come out here and minimise his errors and show the other players that he's here to fight. "The higher level you get the more you focus on something like that because the margins are so small. The players in the locker room will be very switched on to that aspect of the game." At 30-30, the pair embark on a baseline slugfest... first testing their backhands... then forehands... cat and mouse...patience is required - but Federer screws a forehand wide and the Swiss, grunting in frustration, is in trouble.Nishikori comes through, a gutsy hold, and he's not out of it yet. "The one criticism I still feel towards Nishikori at this stage in his career, although he's improved as a competitor, is that he still has some pretty lopsided scores against him and I think - really, were you in the match as much as you should've been?" At least the Nishikori backhand is purring even if his serve isn't. A sublime winner down the line from the world number five on the opening point. Oh. Nishikori botches a backhand and Federer nudges 30-15 ahead. Nishikori seems to have lost his composure, sending a simple-looking forehand over the baseline when Federer was there for the taking. It doesn't take Federer long to conclude the game, with the Swisswinning 12 of the last 15 points. Federer attacking the Nishikori second serve, dancing around to his forehand and pushing his opponent backwards, eventually Nishikori comes a cropper, slipping 15-40 behind to gift Federer two break points. The US Open finalist saves one, but goes long on the next point. Nishikori's intensity has dipped and there's a subdued atmosphere in the O2. A sixth ace of the match takes Federer to 40-0 and both players upping the ante at the beginning of this set. Accurate serving from the Swiss, his first serves in particular are on song. A hold to love and off we go to Nishikori again. The wrist doesn't appear to be hampering Nishikori as he holds to love, the crowd purring as he beats Federer with a whipped winner. In just 73 seconds the game is over. Healing hands are required as the trainer appears on court to examine Nishikori's right wrist. Luckily, the trainer is a well-prepared man; he delves into his rucksack and finds some cure-all tape and wraps it around the world number five's wrist, who then quickly skips towards the service line to start the second set. Rian Hoskins: With the depth of competition in the men's game, do you think Nishikori can win a grand slam or is his game not powerful enough? A man like Federer doesn't get nervous, or does he? The 17-time Grand Slam champion coughs up a double fault to present Nishikori with a 15-30 advantage, but we're soon all-square as an angry forehand winner down the line from Federer. The Swiss slams the door shut on his opponent, but it is too early yet for him to throw away the key. "Whatever happens, Nishikori has had a great year, he's been out there for seven years as a professional. But his record this year in decisive sets (20 wins, two losses) and matches that got to a decider in five sets (four wins and no losses) has been fantastic. He's won big matches that go the distance - and that makes you feel like you belong." Nishikori's head drops as he screws a backhand into the tape, allowing Federer an easy point for 15-15. But he's not down, and certainly not yet out, because on the next point he steps in from the baseline and lasers a winning backhand into the corner. Wonderful play by Nishikori for 40-15, stooping to his shoelaces to volley at the net. A Federer return goes long and it's an impressive hold under such pressure. Clinical. A routine hold for Federer, who finishes off with an ace followed by the old serve and volley. Nishikori needs more than a sniff on the Federer serve if he is to haul himself back into contention in this set. "Federer's 7-0 tie-break win in the second set against Milos Raonic in his opening match was the shortest ever in ATP records - Federer also won the longest ever, 20-18 against Marat Safin in 2004 in Houston." "What Nishikori's not done yet is executed yet on any of the big points. On his own serve he's given away a couple of cheap points and when the big points come along, Federer knows how to play them." An ace swings by Federer. Or did it? The Swiss pauses, raises an eyebrow and challenges. What eyesight that man has. Nishikori's serve was out by a fraction. Federer, on the next point, also shows off his improvisation skills - it wasn't a backhand, nor a forehand, he just held the racquet head in front of his face and dabbed it over the net. Everyone loves a bit of ad-libbing on the court. A see-saw of a game. Break point Federer, but Nishikori saves by dragging his opponent across the baseline before finishing him off with a backhand volley. Canny. Momentum then swings Nishikori's way and he wriggles free. Federer mixing up play nicely, stepping towards the net to hit a forehand winner to drag the game from 15-30 to 30-30. Nishikori unable to truly threaten the Federer serve, returning long to allow the 17-time Grand Slam champion to hold to 30. "It's a promising start for Nishikori, who would have liked to have taken one of those opportunities. "When they get into baseline rallies Nishikori can really have an impact. Federer will be wary of that and when he hits the spot he can really dictate and make Nishikori do the running. "It will be interesting to see how Nishikori's second serve holds up - he served a few double faults against Andy Murray." There's been plenty of high-quality shots in these opening games to suggest the match could flare up into an high-octane blaze of tennis. Is this the moment? Federer roars "come on" as he passes Nishikori at the net for break point. The Swiss has his prey and won't let go - another crackerjack of a forehand winner secures the break. Cue wild cheers from the Federer-loving crowd. "This group has the feel of anyone can beat anyone. Raonic has huge game capable of beating Andy Murray tonight and even if Nishikori wins today, who is to say Raonic wouldn't beat him in the third round of matches?" A glimpse of the danger lurking in Nishikori's racquet as the 24-year-old crunches a backhand winner down the line to level at 30-30. Federer's concentration dips, which allows Nishikori to notch his first break point - but that was the easy bit for Nishikori because Federer comes up with successive aces to save the day. Beautiful! Stonking volleying from the Swiss, finishing the point with a volley which delicately drops on the baseline. Both players delving into their box of tricks - third deuce of the game as Nishikori drills a winning return down the line. Second break point Nishikori as Federer, runing around to his forehand, pushes it wide. But on the next point, Nishikori goes long and Federer won't be giving him a third chance. He isn't that gentlemanly a sportsman. "It was very different to how I thought it would be. I thought it would be really abrasive - there was a nice medium pace, but a lower bounce than I was expecting." Federer made an explosive start against Raonic, of course. winning the first set 6-1 but Nishikori is a tougher customer. Federer's backhand yet to find its rhythm, another one into the tape allows Nishikori to stretch his lead to 40-15. The US Open finalist wraps up the game with little fuss, Federer netting his return. Federer, in his Swiss red T-shirt and matching footwear, gets us started. The six-time champion's backhand faltering, twice failing to negotiate the barrier on that side to gift Nishikori easy points for 15-30. But the world number two's serve gets him out of trouble, and he holds to 30 when Nishikori's return sails long. "This guy Nishikori is the real deal - I really believe that and if he does himself justice this could be a real contest. "He appointed Michael Chang as his coach and you could say Nishikori is the modern day Chang. He's more aggressive, but he's bulked up physically and times that by 10 for how he's bulked up mentally." In an interview with BBC Sport's Russell Fuller, world number two Roger Federer said he's enjoyed a "solid and consistent season" but that his confidence levels are "not quite" what they were when he was at his invincible peak. "I'm not world number one. When you're world number one your confidence is different because you feel like you're the guy to beat. You don't have to adjust to anyone. If you're not number one you feel like you still have to do that against a few guys. "Probably Novak has that feeling right now because he's played another tremendous year. Definitely against most of the guys I enter the arena and I feel like it's in my racquet. Then again, different conditions, different events - it always changes and the margins are very small in tennis." "I was feeling a lot of respect to everybody, especially the top players. I couldn't play anything and the first time I played Roger, I wasn't going for the win. I was just playing tennis against my idol. "That was one of the problems I had, but after a couple of years, mentally I got strong." David Cornelius: May be early days at O2, but initial results evidence the gulf between 1-4 and 5-8 in the current rankings. Trend continue today? Roger Federer may have qualified for this tournament for a 13th consecutive year and could (although his chances are slim) end the year as the world number one, but Kei Nishikori's remarkable year suggest the debutant could pose the Swiss some problems this afternoon. At 24 years old, Japanese world number five Kei Nishikori has finally gate-crashed the tennis hierarchy with his run to the US Open final and debut appearance in London. But which of next year's big tournaments represents his best chance of a Grand Slam - and why? Have your say via Twitter at #bbctennis, the BBC Sport Facebook page or text 81111. After Monday's one hour and 54 minutes of one-sided singles action, expectations are high for a considerably more competitive day at the O2 Arena as qualification for the semi-finals becomes a possibility. As does elimination. 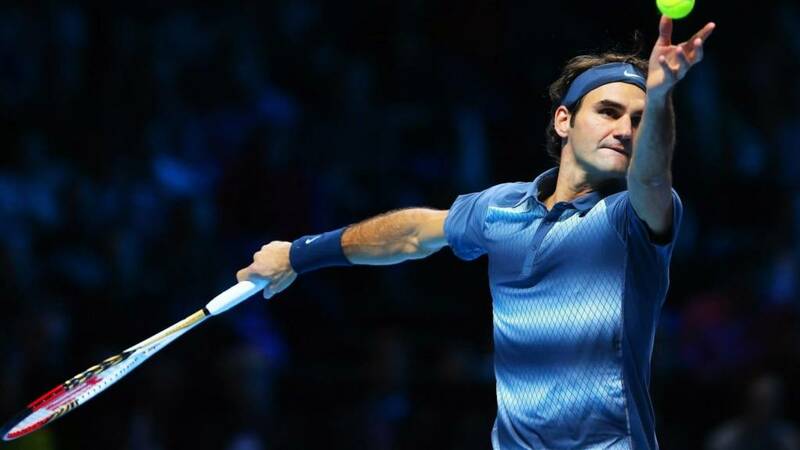 Both Roger Federer and Kei Nishikori can progress today if results go their way, and the Swiss tennis army has fully mobilised for the occasion, while Andy Murray and Milos Raonic will be battling to stay alive tonight. Spectators and organisers alike might just be relieved to see a set go past 6-1 after yesterday. Britain's Andy Murray takes on Canadian whippersnapper Milos Raonic this evening, but first let's concentrate on the afternoon session at the 02 featuring Roger Federer and Kei Nishikori. It's a match which could be described as the old timer versus the new punk in town. The pair are even stevens at 2-2 in their head-to-heads so who knows which way this match will swing. It should be good. What have the tennis gods got in store for us? Straight-set butcherings or knee-knocking three setters? Novak Djokovic, but with players' hopes on the line today the second round of Group B matches could be great. It's do or die. Now or never.